I spent a few weeks in Mumbai this summer and had a g reat time eating out - brunch at Basilico (Colaba), lunch at Samovar, late-night (2 a.m.!) dinner at Zaffran, and many others. But the two best meals I had were at a friend's home where his mom had prepared a number of delicious Sindhi dishes. And I ended up liking one particular dish so much - Sai Bhaji, a hearty dish of greens, vegetables, and some lentils - that aunty very kindly included it in the menu the next time I showed up for lunch! I got the recipe from her, promising to try it out and report the results on Ahaar. A big "thank you!'" to aunty! - it turned out very well and I'm sure we'll make this again sometime soon! In a pressure cooker, heat 2 tspoon oil and saute grated ginger, garlic and the chopped onion. To this, add 4 tbspoons of chana dal that has been soaked for about 2 hours. Then add the pieces of butternut squash, brinjal, and carrots along with turmeric powder, and chilli powder. Cook it for 2-3 minutes. Then on top of this, add the chopped swiss chard/spinach. 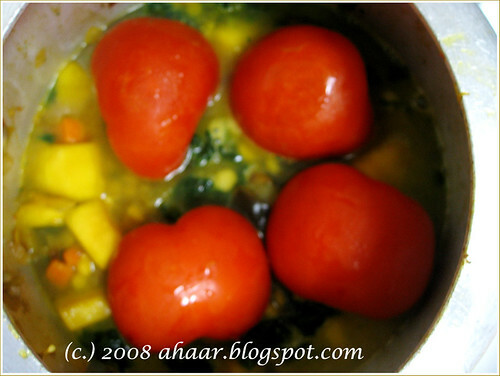 Mix it together with the rest of the vegetables and finally, place halves of 2 tomatoes on top of the mixture and pressure cook (1 whistle). Add salt and whisk together (it is important to not mash everything - whisk lightly). At the end, saute a few pieces of garlic until they turn brown and use this as garnish. We recently celebrated my mother-in-law's birthday. Despite her protests, I decided to bake a cake for her. With my niece as my assistant for baking the cake, our first task was to identify a recipe. So after deciding upon Blueberry Yogurt cake, we got all the ingredients together in the afternoon when everyone was relaxing after a heavy lunch. We were quiet and but the wonderful aroma coming out of the oven gave us away! I am noting the recipe as I made it here as I am sure to come back to it soon. Preheat the oven to 350° F. I used my bundt cake pan for the cake, buttering and then flouring the cakes pan on all sides. In a large mixing-bowl, gently combine the yogurt, eggs, vanilla, oil. In another bowl mix all the dry ingredients - flour, sugar and baking powder, baking soda together. Now add the flour mixture into the yogurt mixture, and blend it together. Once it's complete, add the blueberries into the batter. Pour the batter into the prepared cake pan, and bake for 30 to 35 minutes, until the top is golden brown and a cake tester comes out clean. 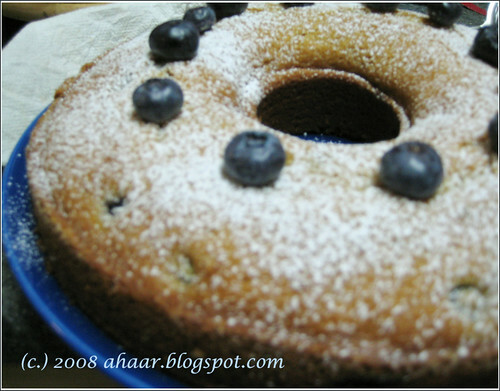 I decorated the cake with some powdered sugar and fresh blueberries. 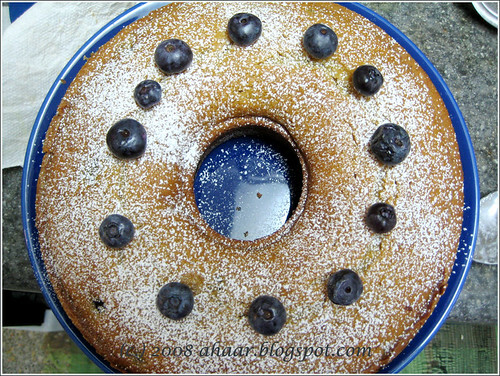 This cake is headed to Aparna at My Diverse Kitchen who is hosting MBP:Fruit Fare. Thanks for hosting! One of the advantages of having parents and in-laws at home is that my weekend brunch repertoire has expanded. No more omelette and pancakes! Now, it's rava idli, pohe, vermicelli upma, rava upma etc. And today I tried pesaratt. 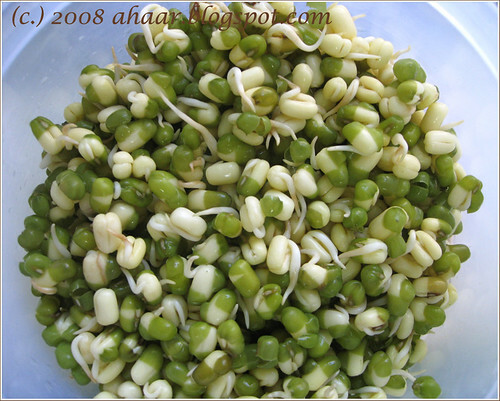 I had soaked whole moong dal for sprouting thinking it'll make a good addition to salads. 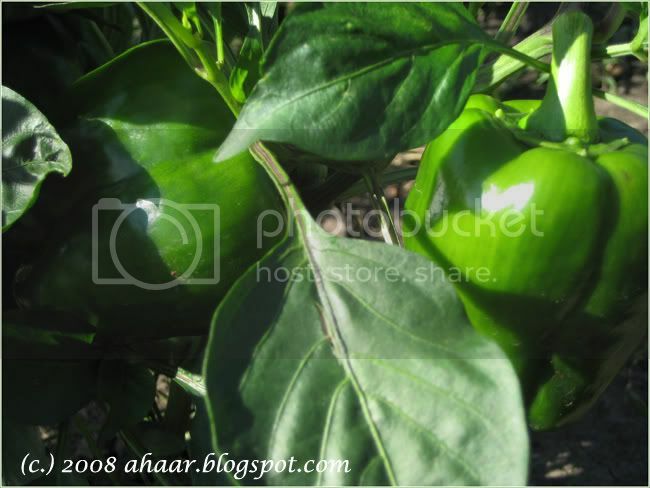 But when my mother-in-law suggested pesaratt, it sounded delicious and I readily agreed. 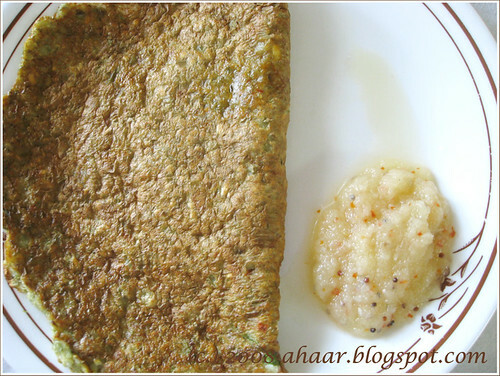 Pesarattu is a popular breakfast or tiffin item in Andhra and Tamil Nadu where it's made with split moong dal. 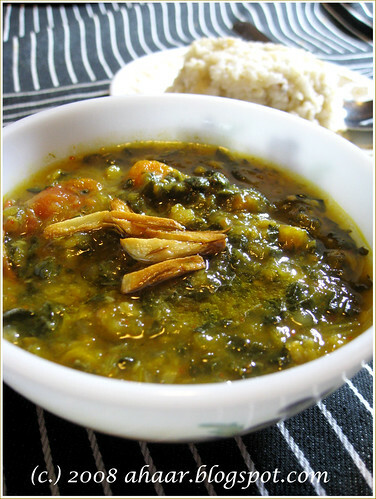 Making it with sprouted moong dal makes it doubly delicious and healthy. Soak whole moong dal for about a couple of days and they'll sprout. Then grind the sprouted dal along with rice, green chillies, red chillies, ginger, cumin seeds and salt to a medium consistency. 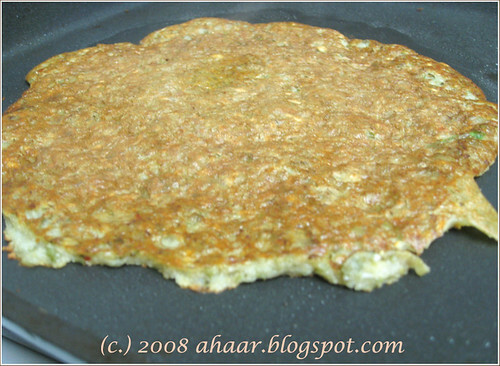 Remove the batter, add about a teaspoon of curry leaves and mix the batter thoroughly. Heat a thick-bottomed pan. Pour one ladle full of batter in the pan and spread it around in a circular fashion. 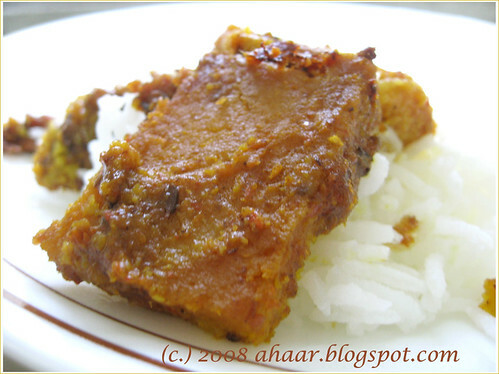 Then add a few drops of oil around the edges of pesaratt. The advantage of making pesaratt on a non-stick pan makes the oil requirement minimal. Wait for few minutes till the bottom gets golden-brown, then flip it and cook the other side now for about 30sec to a min. Serve it warm with chutney. We enjoyed ours with onion chutney. 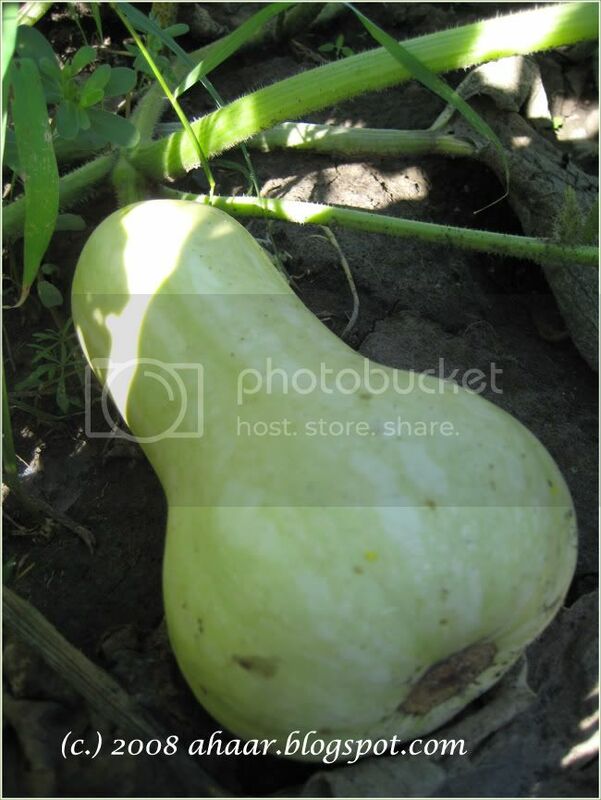 This is going to Susan at The Well-Seasoned Cook who's hosting Legume Love Affair: Second Helping. Thanks for hosting! 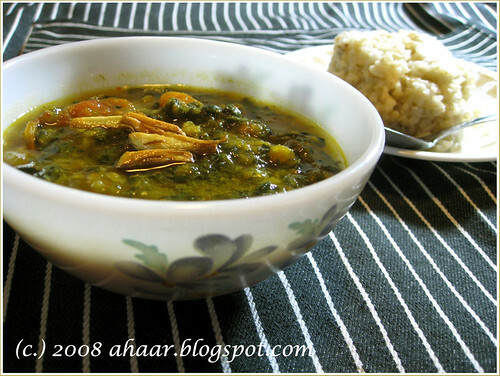 Dhokar Dalna is part of traditional Bengali cuisine cooked and served in Pujo, or as second course of a meal. I was reminiscing about it with my parents, also telling them that I've received a few requests asking for the recipe. And they surprised me with Dhokar Dalna curry the next day. Wash and soak Bengal gram lentils in water for 4-6 hours. 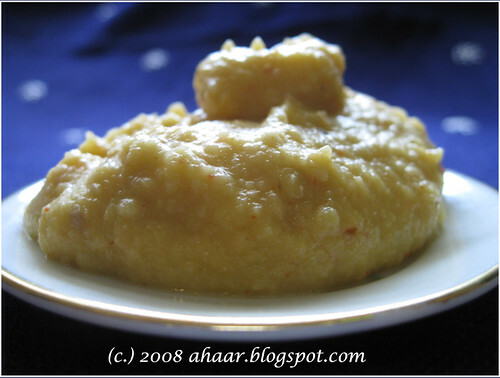 Drain water and grind the dal to a paste in a mixer. Heat 1 tspoon oil and temper it with 1/2 tspoon cumin seeds, asafoetida, 1/2 tspoon ginger paste, 1/4 tspoon turmeric powder and salt. Pour the ground dal and cook till the mixture is soft and sticky, but not completely dry. Smear little oil in a dish. Pour the cooked dal and spread evenly on the dish. Press lightly with your spoon so that it sets properly. Cool and cut the dhoka into square or diamond shapes. 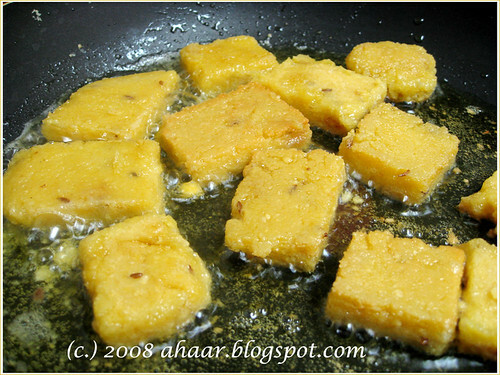 Heat two tbspoon oil and fry the dhokas to light brown. Remove and keep aside. Then heat the rest of remaining oil in a deep bottomed pan and temper it with the 1/2 tspoon remaining cumin seeds. Fry for a minute till it stops sputtering. In the meantime, puree the tomatoes, ginger and green chillies together. Add the pureed mixture with turmeric, red chili powder, coriander powder, cumin seeds powder and saute for 3-4 minutes on low heat. Then, add about two small cups of of water and salt and let it simmer for 4-5 minutes. Add the fried dhokas, and bring the curry to a boil. Reduce heat and simmer for another 4-5 minutes till the dhoka starts to soak up part of the curry. Put ghee and garam masala and take it off the heat. It should be the last thing added. just before the dish is taken off the heat. Serve warm with rice. This is my entry to Curry Mela going on at Srivalli's Cooking 4 all Seasons. Thank you for hosting! For the last month I have been enjoying the different Bengali recipes - puti macher jhol (small fish curry), different kinds of dal (lentils), labra (mixed veg), lau ghonto (bottlegourd) etc. But when my parents offered to make puli pithe for a family gathering I was excited. It's been ages since I ate pithe. My fondest memories of pithe are during winter when my grandmother would make several kinds catering to each of our requests, pathi shapta for me, puli pithe for my brother and gokul pithe for my dad among others. Pithe are a winter affair, around Poush Sankranti (somewhere in mid Dec - mid Jan) to celebrate the harvest festival of the new crop. Pithe's made of rice flour or wheat flour which forms the base or pouch. Inside the pouch filling or pur made of grated coconuts and sometimes sweetened vegetables is stuffed. The pouch can be of different shapes - flat like a crepe, oval, round etc. The pithe can be prepared by frying, steaming and then cooked in a milky syrup. Some of the famous pithe are: pati shapta (like crepes with stuffing inside), ranga alur pithe (made of sweet potato), dudh pulli (with payesh kind of preparation of milk), chandrapulli and gokul pithe. I am sure there are more varieties of pithe. Please leave the names in the comments and I will add it in the list. The ingredients for Puli Pithe is a small list - coconut, rawa (sooji), milk and sugar, but when they all mix together, it tastes heavenly. I love gurer (jaggery) pithe, so we tried to replicate it with brown sugar and I loved how it added that deeper taste to the pithe. Here is how they made it. 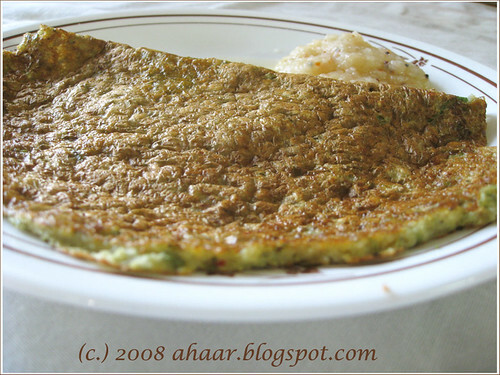 Heat a thick bottomed pan or karai (wok) and cook the grated coconut, rawa with 1 cup sugar and 1/2 cup half and half till the mix comes together and starts leaving the sides of the pan. In Bengali, it's called paak. Once it's done, take in off the heat and roll them on your palm as little cylinders. You won't need any extra oil for the rolling. In the meantime, heat the rest of half and half with milk and sugar on low heat till it starts to thicken. It may take about an hour for the milk to become a thick creamy base. Once it done, put the coconut and rawa pur in the milk and let it boil for another 5-10 minutes to let it absorb the milk and cream. You can sprinkle some cardamom powder on top before serving. But I like it without it to full savor the taste of milk, coconut and sugar cooked together. Also a big thanks to Sandeepa of Bong Mom's Cookbook for the beautiful green spread that you see in the picture. It arrived with a beautiful handwritten note embellished with Little S' drawing and a set of beautiful coasters. Thank You Sandeepa! When I taste something new that is delicious, yet simple to prepare, I always wonder how come I've never tried this before! Has it happened to you too? I am sure I can recollect many such incidents, but the latest was when Aswin made this pumpkin chutney. This is traditionally made with the remnants after making a pumpkin sabzi - the outer layer and the mushy inside along with pumpkin seeds. We didn't have any pumpkins at home, but we did have some acorn and that's what we used for the chutney. 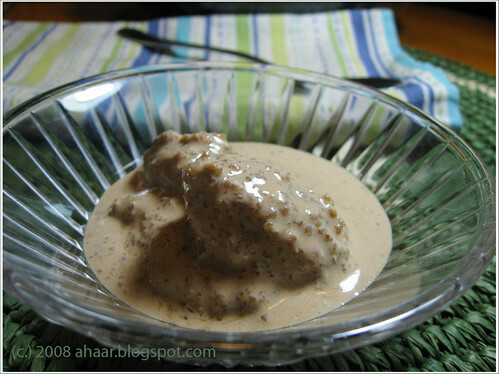 The mild sweetness and the smoothness of the acorn combined with the earthiness of urad makes the base of the dish. But there is a heat that kicks in when you take the first bite and that comes from the red chillies and some peppercorn. 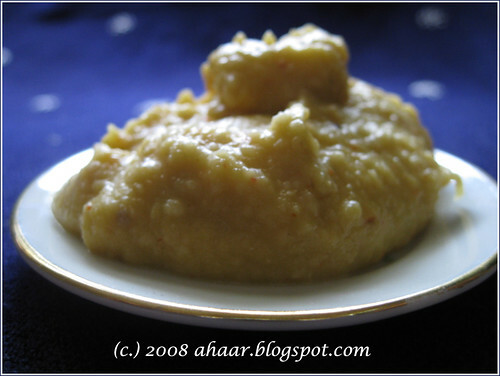 This mildly fragrant chutney was a big hit in our weekend lunch. I almost made a meal out of it and so did my dad, mixing it with some hot rice! Microwave the acorn for 4-5 minutes till they turn soft. You can also do it on stove top. In a pan with 1 tspoon oil, roast urad dal, peppercorns, and red chillies until you get a fragrant smell. 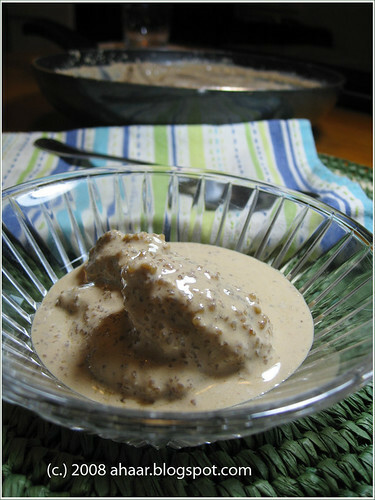 Mix all the ingredients together and grind it to a paste in a food processor or mixer. Serve warm with rice (usually as a first course). 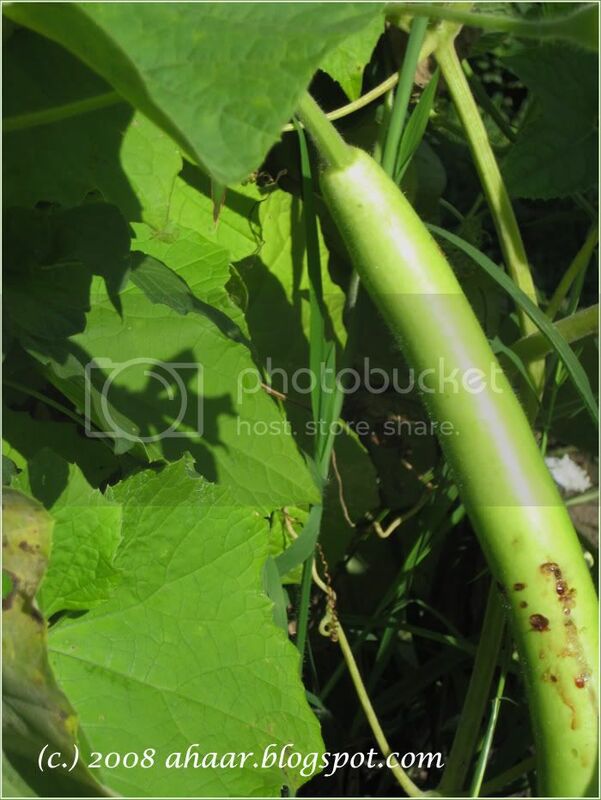 Photo-essay - Summer Garden Plot! We have been traveling almost every weekend with my parents, showing them parts of Boston, Buffalo, Detroit, and Chicago. Last weekend we were in Chicago visiting my sister-in-law's family and I had a chance to visit her garden plot that she has been cultivating for a few years now. 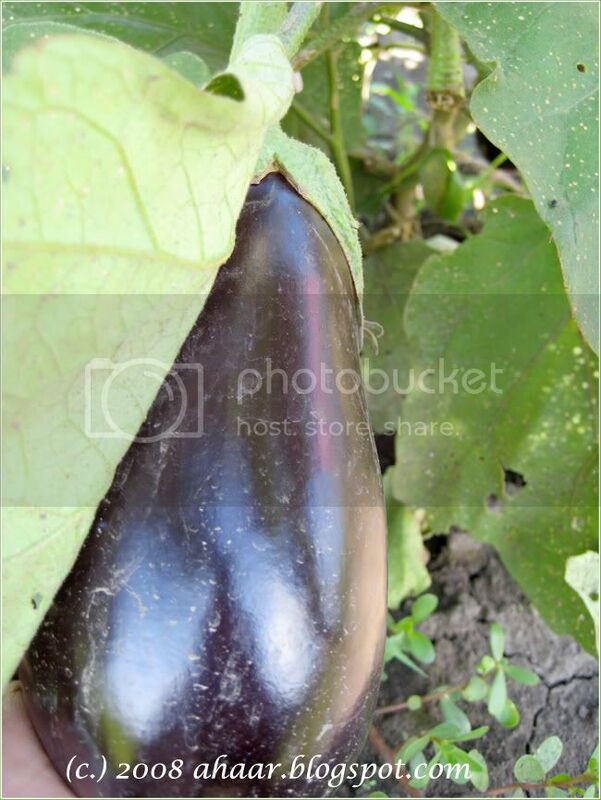 The plot was filled with eggplant, cayenne pepper, okra,green pepper, tomato, corn, squash, cabbage, watermelon, muskmelon and much more. I clicked some pictures and wanted to share them here. 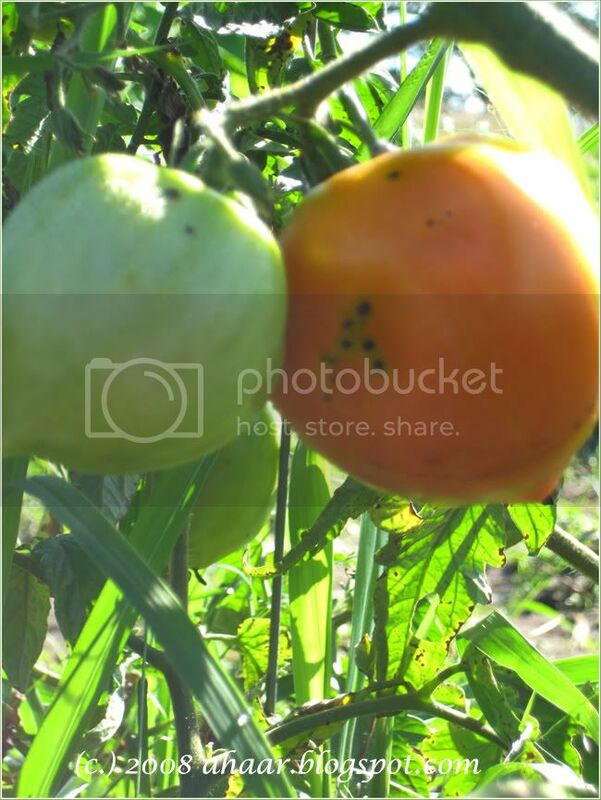 We spent some time there looking at each plant, even nooks and corners for ripe tomatoes, okra, eggplant that's ready to be harvested. It was wonderful!